A recent event in Delhi highlighted how several senior members of the international organisation have faced serious allegations of sexual assault but the investigations have been mostly flawed and biased. New Delhi: A systematic and institutionalised culture of sexual harassment at the UN, an organisation that claims to stand for human rights globally, prompted AIDS Healthcare Foundation (AHF) India to come forward and address the issue at a press meet in Delhi this Thursday. 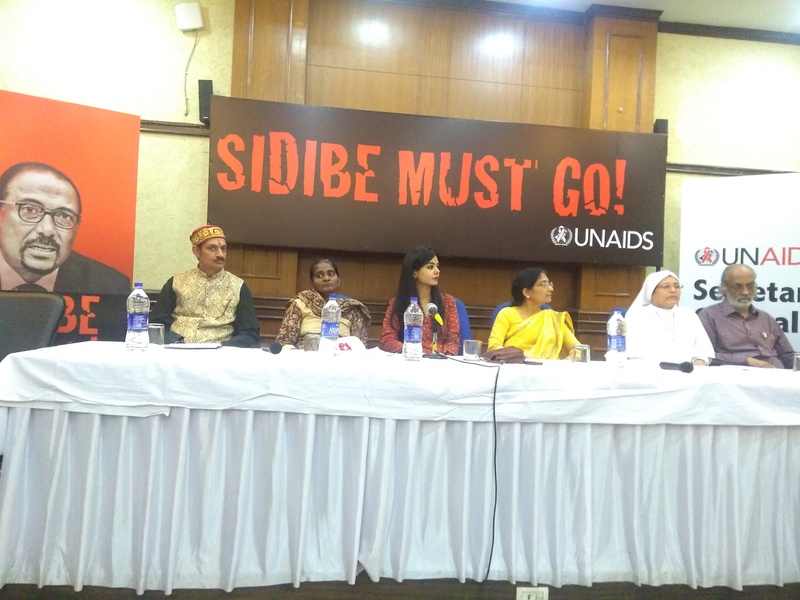 Chanting “Sidibe Must Go”, the organisers released a joint statement – signed by 40 civil society organisations – demanding Micheal Sidibe, executive director of the Joint United Nations Programme on HIV/AIDS (UNAIDS), to immediately step down. The organisers have sent the statement to the UN secretary-general Antonio Guterres. Sidibe is accused of mishandling the sexual harassment allegations against Luiz Loures, the former UNAIDS deputy executive director. Martina Brostrom, UNAIDS external relations officer, had publicly spoken about being assaulted by Loures in a lift. After a long 14-month investigation, Sidibe, acting both as a key witness and final decision-maker, found her allegations “unsubstantiated”. During the investigation, he also allegedly offered her a promotion in return for withdrawal of her complaint. The key speakers at the event, including Prashanti Tiwari – the architect of ‘Bandhan Tod’, a campaign by Gender Alliance, a UNFPA India initiative – who is reportedly a victim of sexual assault, delved into the prevalent cases of sexual harassment that plague the high-profile global institution. Tiwari had filed an FIR against UNFPA India chief Diego Palacios for sexually harassing and assaulting her when she worked as a third-party contractor with UNFPA as part of Gender Alliance team in Patna. UNFPA, in a somewhat vague reply, has said that Tiwari was never an employee of the organisation and that Palacios “had met her only once”. Investigations into Tiwari’s case came to a standstill because Palacios, as a member of the UN staff, is entitled to diplomatic immunity. Even though UN secretary-general Guterres’s spokesperson Stephane Dujarric said that UN employees have no immunity in cases involving crimes including sexual abuse, he later retracted the statement the next day and said that only the UN chief could remove the immunity. The handling of Brostrom’s and Tiwari’s cases – though they differ in many aspects – are also marked by striking similarities. The cases draw attention to the contradictions in what UN advocates and what it practices. Soon after Brostrom spoke about her sexual assault, Malayah Harper, now general secretary of World Young Women’s Christian Association (World YWCA) called for an inquiry into the sexual assault allegations at UNAIDS. It has been reported that Harper herself faced sexual harassment while working at UNAIDS. Her demand for an inquiry was supported by six other current and former UNAIDS employees, reported The Guardian. Harper claimed to have been assaulted by Loures inside a lift in 2013. She said that she did not report the assault since she believed that no action would be taken. Her perception of the organisation’s inaction stemmed from the fact that the UN had not properly handled an earlier complaint she had made of bullying and intimidation of an employee. Just how widespread sexual harassment is and the many levels of impunity the harassers enjoy can be gauged from extensive media reports on the issue. “We know there are people taking their golden handshake from us here and knowing that they have a job and then attacking us. We know all about that. We know every single thing. Time will come for everything,” said Sidibe. Based on its interviews with employees of UNAIDS, The Guardian found that 15 of the employees interviewed admitted that they had experienced sexual harassment or assault over the last five years and only seven had formally reported it. Three women said that they had been forced out of their job or threatened with termination after they complained. One of the women who ended up losing her job said that an internal investigation dismissed her complaint despite medical evidence and witness testimonials. She also lost her visa. Similarly, though Tiwari complied with Indian government’s request to cooperate with the UNFPA, she was later “informed by them that this investigation was just an administrative fact-finding process.” “Neither will I get the report of the investigation nor will I have the access to what the accused has to say, unlike what happens in a criminal investigation,” she rued. Barrister Alex Haines claimed that UN routinely faces conflict of interest issues. In 2015, a man accused of sexual harassment in central Asia interviewed the woman who had complained against him. Haines added that victims are often not even provided the final report of the investigation. Pula Donovan co-director of Aids-Free World said that since the perpetrators of such crimes can be easily moved to some other part of this mammoth organisation, UN cannot be compared to any other industry like Hollywood, tech, etc. Moreover, when it comes to exploitation of local people, UN senior staff has diplomatic immunity and thus, can avoid national courts. After the criticism and backlash that it received, UN gave a statement that they had a zero tolerance policy towards sexual abuse and had clear procedures to address complaints. “United Nations does not prevent staff from speaking to the media, and UN staff accused of crimes do not enjoy diplomatic immunity. We seek to facilitate criminal proceedings by waiving immunity in such cases,” said the statement. The truth might be a little different. Another employee added that it was not an anonymous request and if you questioned it there would be retaliation from the top. UNAIDS also sent a mail to staff advising them to not respond to media or “circulate emails, web links, tweets, social media links or any other material containing information that is not authenticated by UNAIDS.” The warning said that this would protect them and the organisation from any case of defamation of libel. “UN is an organisation that can’t tolerate any black mark on its reputation,” Tiwari said adding that a serious cultural reform was needed in the organisation.